So another batch of brisket jerky made last night, this is the first of it to come from the oven this morning. My question is in the flavoring. While the jerky is good; dry but not brittle, the flavor is lacking much. Tastes like dried beef, not the jerky taste you would expect It's almost as if the marinade didn't take at all. It marinated for about 3 - 4 hours, and the slices were ranging up to no more than 1/4' thick (pre-dry). The marinade itself was pretty basic, soy sauce, worcestershire sauce, salt, pepper, onion and garlic powders, cayenne, liquid smoke (since I dry in my oven) and some water. The marinade was also strong to the taste (I didn't really measure anything, just added til I had the flavor I wanted in a good concentration). Is it the marination time that needs to be extended? The second half of this batch marinated overnight, a minimum of 10 hours for sure. Jerky is drying in my oven at 150-160 for about 12 hours. Any ideas? Re: Where could I be going wrong? Can you taste the salt? If so how salty? Papa Tom wrote: Can you taste the salt? If so how salty? Can't really taste it at all. It's almost as if it didn't take any of the marinade. Kinda why I'm leaning toward the time spent in the bath. That's why I asked about salt. If the brine is salty the meat provided enough time in the solution would be just as salty. Soooo this answer is more time in the bath. BTW I have had this happen to me but for a different reason. The flat pieces of meat tend to stick together and act like a thick piece of meat in the brine so make sure each piece gets good contact with the solution. I thoughtlessly (busy) dumped the slices in a plastic bag and poured the brine in giving them an overnight soak which would have been good if they would have been separated. Probably a better method is to add the meat to the brine one slice at a time. I've never made jerky with brisket but I guess it would be like almost any other beef jerky. I use pretty much the same marinade only I let mine sit in the fridge overnight. I agree the time is probably the issue. I like to use brisket because of it's heavy striation, much like fajitas. This actually makes really good jerky depending on how you cut it. 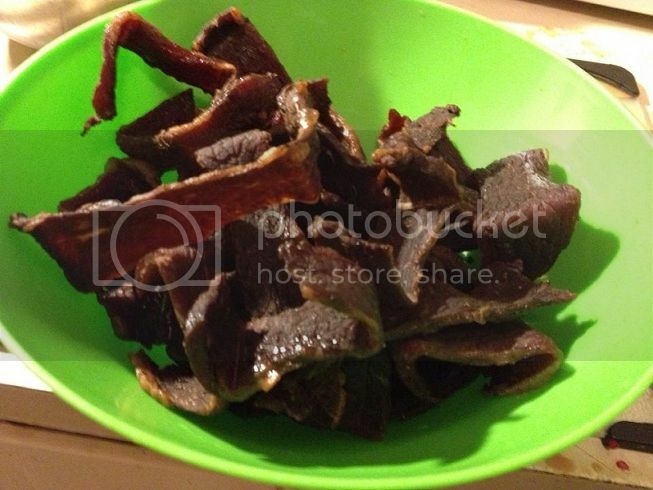 Cut cross-grain, it is very tender, flaky cut of jerky. Cut with the grain, it's jerky with a fight, and provides a good piece to "work on" for a bit. Great for long road trips as you have pieces to chew on (much better tasting than a pen or pencil!) Either way, brisket has a great flavor on it's own, which is why I use it. Papa Tom wrote: That's why I asked about salt. If the brine is salty the meat provided enough time in the solution would be just as salty. I grab a handful of meat, toss it with the marinate in a bowl, mix it up real good, making sure the pieces are seperated and coated and then toss it into the bag. Repeat and pour the marinate over the top, seal it and distribute the marinate in. Hope your next batch turns out better. Yup.. Tried a small piece form the second batch now and BIG difference. Marinade time is the only difference between the 2. Same oven, same racks, same temp.. Just need to prep the batch at least 12 hours before going in to dry. Thanks to those offering input, seems the consensus said the same thing here.. LAWD, I love this forum!